Time for some fun with numbers! 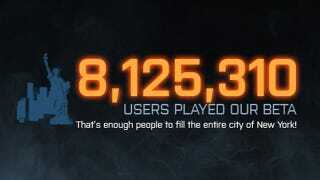 With the open beta for Battlefield 3 now over, developers DICE and publishers EA have shared some stats from the slaughterthon. It's the really big ones that grab you first, like 47 billion shots being fired, 1.5 billion kills being recorded or over 8 million players taking part. But take a second look at that headshot figure. Someone shot another player's head off from 635 metres away. My hat is off to you, sir/madam, on the proviso you don't shoot my head from half a city away while I tip it. One number missing, but one I'd love to see, is number of recorded users complaining they didn't get enough time on Caspian Border. It probably gives the "shots fired" tally a run for its money.